Proprietor Dr. Robert B. Pamplin, Jr. is a businessman, philanthropist, farmer, minister and author of 13 books, including two book-of-the-month-club selections. He has earned degrees in business, economics, accounting, education and theology. He is President and CEO of the R.B. 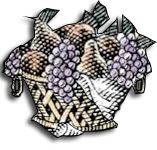 Pamplin Corporation, a family-owned company with annual sales approaching $700 million, and is the founder of the Portland Tribune newspaper, Columbia Empire Farms, Your NorthWest retail stores and Anne Amie Vineyards. Dr. Pamplin has served on Presidential and State Commissions, and as Chairman of the Board of Trustees for three colleges. He has been the recipient of many honorary degrees and national awards, including the Distinguished Leadership Medal from the Freedoms Foundation at Valley Forge, the National Caring Award from the Caring Institute, the Herman W. Lay Memorial Award for being the outstanding Entrepreneur of the Year, and America’s Outstanding Individual Philanthropist by the Association of Fundraising Professionals. Most recently, in Oregon, he has been honored with the Governor’s Arts Award, Entrepreneur of the Year, Portland’s First Citizen, and selected by the Business Journal as one of 20 Leaders of Change over the last 20 years. Thomas’ winemaking career unofficially began in the basement of his parent’s home in Hampton Roads, Virginia. His Welch’s grape juice and orange juice concentrate wines are lost in time, but we’re sure they’d be showing well if any remained. Thomas narrowly escaped blindness from this stage of his life and went on to New York City, where he pursued a career in modern dance. Traveling the globe performing was great but it did not get him much free beer. So, he bought a book and taught himself to brew. With the creativity of a dancer, the eye of a scientist, and the encouragement of friends who loved the free beer, the passion for fermenting reemerged. Thomas left the stage and went back to school at CSU Fresno in the enology program. It was there he fell in love with Pinot noir. And, across the globe he embarked again, first to California’s Anderson Valley, then to New Zealand, and finally to Oregon. After four years at Ponzi Vineyards, Thomas saw the opportunity to express himself at Anne Amie Vineyards where he is happy he can still use words like balance, grace, fluidity, elegance, power and style- words that once described his dancing, now describe his wines. In his free time, Thomas still brews, having dragged his equipment across the US. Yoga and running have replaced dance, but winemaking remains the common thread that started in a basement and continues at Anne Amie. 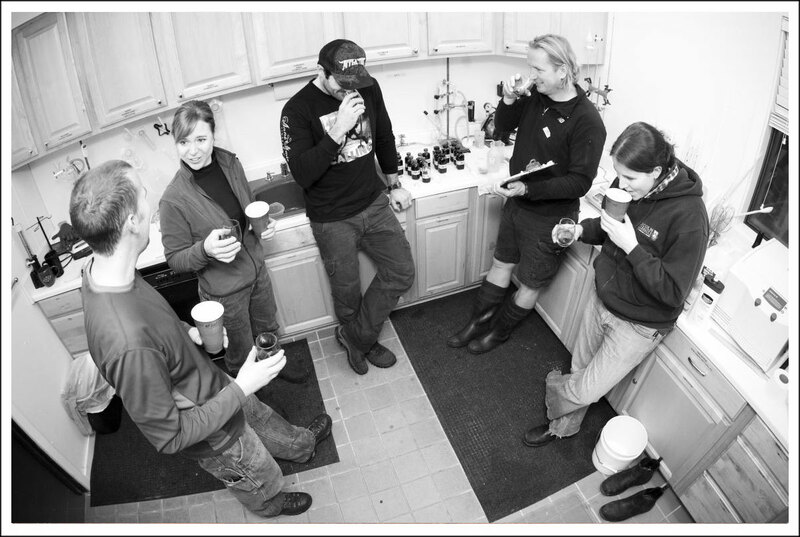 Andy Gribskov, our Production Winemaker, is a one of the rare Native Oregonians. He grew up in Aloha, and studied at Oregon State University, where he majored in Food Science. As an avid home brewer, he was thrilled that he could study fermentation sciences. As Andy says – it takes a lot of good beer to make good wine! 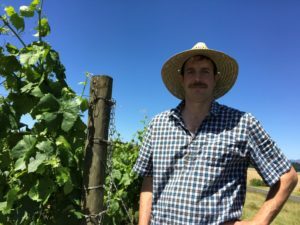 Andy has worked harvest at Giesen in New, Zealand, Tyee in Corvallis, and came to us from LaVelle where he was the cellar master and winemaker. 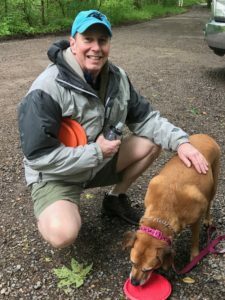 Andy enjoys playing golf, skiing, hiking, and Oregon State Football. He lives in McMinnville with his wife, Jill, and his daughter, Molly. K. Egon Smith, CSW lived the idyllic “Song of the South” childhood in Marietta, Georgia. At 18 years old, he joined the US Navy to see the world. As an Aerographer’s Mate (Naval weatherman) on the historic USS Missouri on its second commissioning, Egon circumnavigated the world, crossed the equator twice-once at the international dateline, making him a “Golden Shellback”. After four years in the Navy, with an expanse of experience and knowledge, Egon considered his options: continue as a weather forecaster, clown college, or live off the land. He settled on attending Kennesaw State University, majoring in business and Theta Chi. He took a full-time job with Delta Airlines at the busiest & biggest airport in the world. With Delta for 10 years, Egon specialized in engine repair of the L-1011 B-757, and B-767 aircraft. While he was at Delta, Egon developed a love of wine and the science of making it. In 2001, he decided to sell his home and move to CA to attend Fresno State to become a hippy winemaker. Upon graduation, he moved back to the southeast and made wine with several facilities, including Childress Vineyards, the largest producer of European vinifera in North Carolina, with a production of 55,000 cases, annually. He was with Childress for 7 harvests. In 2016, Egon and his wife, also in the wine industry, decided to move to Oregon to be a part of a world-class wine region. His favorite movie is The House of Flying Daggers, favorite food is his wife’s “Cheeseburger in Paradise” Pizza, and his favorite music genre is gangster rap. Their dog and two cats play poker during the day. Kim hails from the rolling hills of Virginia horse country. Raised on Southern Cooking and Sweet Tea, she took her country roots and made them international. 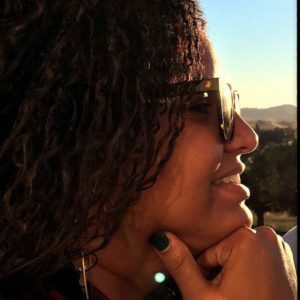 Her love of travel and sense of adventure landed her in Stellenbosch, South Africa where she spent three years working in the wine industry. It’s there that her appetite for amazing food and wines began. Kim brings with her deep organizational skills acquired while working 8 years for the U.S. Department of Energy in Washington D.C. While there, Kim was instrumental in designing, implementing, and operating the first Federal entitlement program in over 30 years. After moving to Portland in 2004, Kim joined the Anne Amie tasting room staff to keep her wine knowledge sharp. She fell for pinot noir and we fell for her and the rest, as they say, is history. 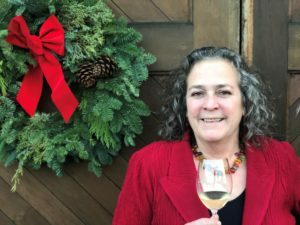 Kim oversees our sales and marketing programs and can be found at the winery and events both locally and nationally sharing the wines and good word of Anne Amie Vineyards. In her free time, Kim can be found hiking with her dogs, seeing live music, gardening, and eating all of the delicious food her husband cooks. Born in Charleston, SC and raised on low-country cooking, food has always held a special place for Boyd. After attending Clemson University, he moved to Atlanta, GA, where he worked in a restaurant, and while his love for food continued to grow, his passion for wine truly blossomed. Though he switched his restaurant gig to ad agency work, Boyd continued his wine education with sommelier seminars and classes on wine. While it was a Napa Cab that initially turned the key, it was an Oregon Pinot Noir that truly sealed his fate, and Boyd moved to Portland in May 2008. While working in advertising, Boyd spent his weekends working in tasting rooms around the valley and helping out his favorite producers. Most of his free time was (and still is) spent studying wine, drinking wine or helping out wineries in some capacity. After eight years in advertising and a year and half working tasting rooms, Boyd has found a home at one of his favorite wineries in the valley, Anne Amie. When not eating out or doing something wine related, Boyd can be found reading books, listening to music, geeking out on the web, watching movies, attending concerts, or obsessing over anything Clemson sports related, generally pairing a glass of wine with each activity. After spending nearly 15 years in hospitality working in renowned Michelin Star restaurants in Europe and high-end restaurants in Oregon, Rodolphe transitioned to the world of wine in 2009. Since then, he feels, he is fortunate and honored to have worked with some of the Willamette Valley finest wineries such as Sokol Blosser, Archery Summit, and Gran Moraine. His Journey took him from Tasting Room Manager, Hospitality Manager and lastly Direct Sales Manager at Anne Amie Vineyards. Passionate, driven and dedicated, Rodolphe finds balance by spending time with his wife and kids in their secret garden of Amity. Tiquette hails from a magical land in the Bay Area known as Saratoga, but really considers herself a gypsy. With half her family being from Bussum Holland, and the other half hailing from Camden Arkansas, there were always places to go and things to see. Spending her summers overseas really gave her a chance to explore different foods, and from time to time, indulge in the rich history of beer and wine. After graduating from Chapman University, she moved to Los Angeles to figure out “what was next”. While entering into this next chapter, she would regularly travel to any wine country area she could, and this is where her passion for wine blossomed. While tasting with her parents one weekend, the question was asked “why don’t you go into the wine industry?”. So with that, she dove in and went for her Sommelier certification. After successfully completing her first level, she came up to Portland to visit her dear friend and celebrate. It was that trip where she met two wonderful individuals who happened to be connected to the Director of Sales and Marketing at Anne Amie Vineyards. For Tiquette, this was a sign that just maybe she was meant to be here. She went in to the winery and immediately knew she was home, and the next day she was hired. One month later she officially moved up to Oregon, and has been at Anne Amie Vineyards ever since. She has had an incredible two years so far, and can’t wait to see what’s next. 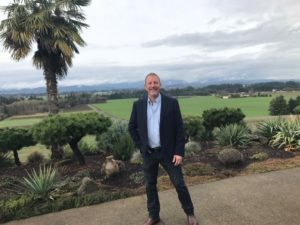 William most recently was the General Manager at Methven Family Vineyards & Winery and comes to us with a wealth of experience in the hospitality industry. He was with the Hard Rock Café, Hotel & Casino for ten years at his former home in Las Vegas, Nevada and was a gaming, nightclub, and restaurant developer with tennis star Andre Agassi and others in several entertainment and restaurant concepts in Las Vegas. He has a passion for wine and food and just loves to throw a good party! 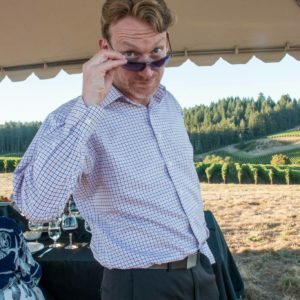 (And tell some stories about his exploits in Las Vegas, well some of them) He has been a part of the evolution of the Oregon wine industry over the years and looks forward to being your ambassador for all things wine club at Anne Amie and developing lots of great events for you to enjoy. Debbie came to us from Firesteed Cellars as the Tasting Room Manager. Her expertise in hospitality comes mostly from working with students, families and professors at UCLA. After 30 years in academia it was time for a change. She ventured to Oregon with the thought of buying a home and expanding her people skills in the hospitality side of the wine industry. In her spare time she enjoys herding her chickens and butting heads with her goats! Lisa joined us in 2015, excited to be part of a small team within the wine industry. She brought her years of experience in operations and small business consulting. She played a major role in a northwest start-up as their Director of Operations for 14 years. Lisa’s family of origin traveled extensively and even lived in Kathmandu. The experience of the nomadic lifestyle gave her the gift of adaptability and self-reliance. She also has an enduring sense of adventure that leads her to explore novel ideas, new geographical regions and fresh roles for herself. She has a great passion for the outdoors, is a Master Gardener, Certified Health Coach and has an online business for natural pet products. 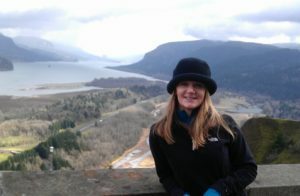 On her time off, Lisa can be found hiking, riding a motorcycle or mountain bike, relishing the natural beauty of Oregon. Raised in upstate New York and Vermont, Peter is comfortable with overcast days and wearing layers for warmth. After graduating with degrees in English and History at the College of William and Mary in Virginia, he started working at a winery east of Charlottesville, where he assisted the vineyard manager and winemaker. He became excited by opportunity to shape a wine with practices in the vineyard. He further shaped his experience in California, Oregon and New Zealand. Along the way, he earned a degree in Viticulture and Oenology at Lincoln University in New Zealand. After working in the vineyards and cellars of Escarpment with Larry McKenna in Martinborough NZ, and Ted Lemon of Littorai on the Sonoma coast, Peter decided to focus on growing and crafting cool-climate wines. Before Anne Amie, he managed vineyards for Stirling Fox in the Willamette Valley.